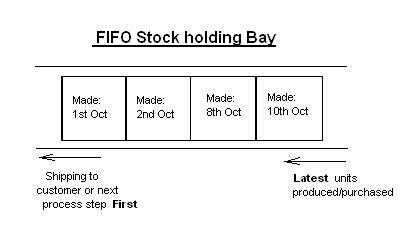 A FIFO warehouse system is an inventory management system in which the first or oldest stock is used first and the stock or inventory that has most recently been produced or received is only used or shipped out until all inventory in the warehouse or store before it has been used or shipped out. This ensures that the oldest stock is used first and reduces the costs of obsolete inventory. It is also considered the ideal stock rotation system. This inventory system is common used in many industries and is sometimes combined with other warehouse, inventory management models and inventory systems such as the EOQ modelor any other multiple order inventory model.